Canara Bank offers many exciting options under their recurring deposit scheme which allows you to build your savings with monthly fixed deposits and earn interest on the deposited amount over a period of time.Continue reading to see what Canara bank’s recurring deposit options have in store for you! Upto 7.35% RD rates are offered with quarterly compounding. There is no limit to the maximum amount that can be deposited. The deposit period ranges from 6 months to 120 months. Loan facility upto 90% of deposit can be availed. 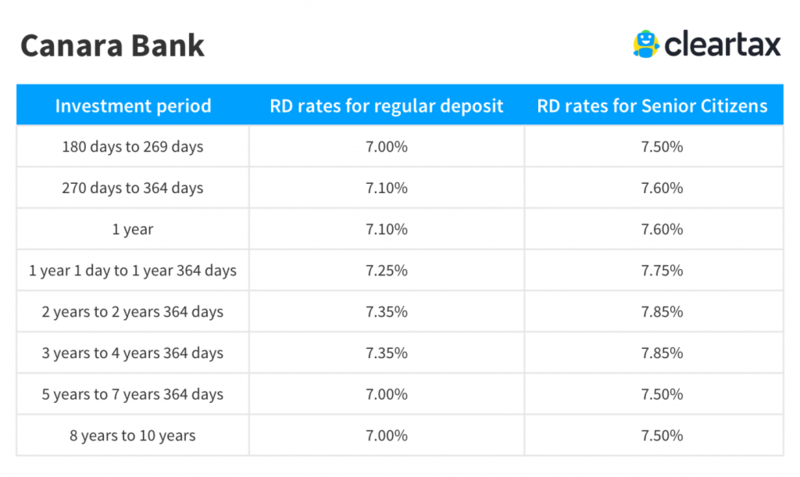 Canara Bank Recurring Deposit: Is it the best way to save? Trust, company, sole proprietorship, firms associations etc. Premature withdrawals can be made but they are subjected to a penalty of 1.00% rate. Prematurely closed deposits will earn an interest 1% less than the initial applicable interest based on the recurring deposit scheme chosen. All recurring deposits, including Canara bank recurring deposit, are taxable under the Income Tax Act 1961. The money that is invested in RD will be included in your yearly income and a TDS ( Tax Deducted at Source) of 10% is applicable on the interest earned ( If it is more than (if it is more than RS. 10,000 per year).To save TDS on your RD gains, you can fill either Form 15G or Form 15H.